A file photo of RBI governor D. Subbarao. 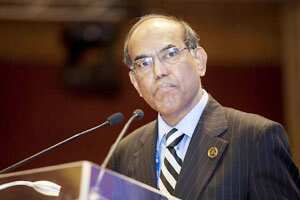 Hyderabad: Reserve Bank of India chief Duvvuri Subbarao on Tuesday said monetary steps may be warranted to curb inflation expectations in face of sustained high food inflation, flagging the need to revisit politically sensitive subsidy schemes in agriculture. Food inflation has been stubbornly high over the last few years in India, inspite of record foodgrain production and robust buffer stocks. The RBI has already raised rates 13 times since early March 2010 to clamp down on stubborn inflation, largely driven by high food prices. “The direct role of monetary policy in combating food price pressures is limited, but in the face of sustained high food inflation, monetary action may still be warranted to anchor inflation expectations," Subbarao said in a speech at a conference in Hyderabad. The comments, hawkish as they seem, may not warrant a change in RBI’s stance which has signalled a likely pause in rate hikes in the December policy and may be extend it, if inflation falls in line with the RBI’s projected trajectory. The central bank, in a bid to ease tight banking system liquidity, will buyback bands upto Rs10,000 crore ($1.9 billion) on Thursday. Subbarao said large increases in the minimum support prices on food grains by the government to farmers was one of the reasons driving food inflation. “There is a case for revisiting subsidy regime for a number of reasons, including the pressure it exerts on food inflation." His criticism comes on the first day of a parliamentary session in which the government will propose doubling food subsidies to about $24 billion in an effort to bolster its support among millions of poor ahead of state elections. Agricultural subsidies are a politically volatile issue as farmers constitute a large votebank for political parties. The central bank chief also said the supply chain of farm products is a major source of price pressures and the cross-country experience on the benefits of multi-brand foreign direct investment on inflation is “ambiguous". Cabinet may decide to allow chains such as the world’s largest retailer Wal-Mart Stores Inc to operate in the country with a majority stake under strict local sourcing rules, a senior government source told Reuters. A draft cabinet note suggesting so-called multi-brand retail foreign firms could hold up to 51% ownership has already been reviewed, a senior government source said on Friday. Subbarao also said that the government’s proposed food subsidy bill is another major potential source of inflationary pressure. “The higher food subsidy burden on the budget will raise the fiscal deficit, exacerbating macro level inflationary pressures." Estimates suggest that 68% of the country’s 1.2 billion population will get a legal entitlement for food grains after the bill is enacted, which will significantly raise annual grain procurement demand even as the available marketed surplus would not increase in the same proportion. The governor made it clear “a lasting solution to food price pressures lies in a supply response" from the government. Data released last week showed India’s food price index rose 10.63% and the fuel price index climbed 15.49% in the year to 5 November. The central bank chief said the RBI’s rupee policy remains the same, on a day when it slid to its life-low. “Our (RBI’s) policy remains the same, which is to manage volatility in exchange rate and to ensure that exchange rate volatility does not impair macro-economic stability." Subbarao, added that exchange rate movement, especially in the last three to four days was driven by global dynamics and the RBI expects reverse adjustment (in rupee) to take place when the European situation resolves itself. “Till then obviously I can’t comment whether the RBI is intervening or not but we are watching the market," he said. Earlier in the day, the partially convertible rupee hit a record low of 52.73 per dollar and at 01:30 pm was at 52.465/470.